One of the first things I ever learned how to bake was an apple pie. Yes, I know it's stereotypical. The American girl bakes apple pies. Big surprise. But anyways. That's what I first learned to make. 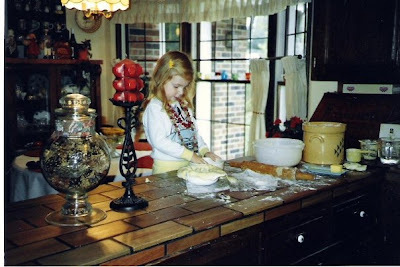 Here's me at age four, first learning to make an apple pie in my Grandma Jackie's kitchen. I've always loved apple pie. It's tangy, sweet, buttery and gooey. It's even better with ice cream on top. Fast forward to the year 2010. I'm craving apple pie, but I live in Singapore. The first and last time we bought apples here, they were smaller than my fist and already rotten in the center. They also made us buy five because that was the special. In Singapore you only buy what the special says. You cannot buy two or three if the special says "Five for $5". You buy five. Trust me. They get really confused at the register and call their manager over. You must buy five if the sign says five. So basically, we had five nasty apples and a headache from trying to explain our desire to only purchase three apples. This was so something I never wanted to deal with again. But I wanted apple pie. So it's a good thing that Aaron's grandma sent us this stuff. It also worked out that I had a pie crust mix that desperately needed to be used as well. We're in "Operation Clean Out our Pantry" mode and things like that are better to be used than packed and shipped back to Kansas where they may sit in storage for weeks and weeks. So I mixed the crust mix with water, rolled it out, filled it with the pie filling and baked it. Ta-da! Apple pie in Singapore. It wasn't perfect, but it was apple pie. And sometimes that's all you need it to be. How much longer do you have in the Island of Not-So-Good Apples? It all depends on how well the job search goes. Maybe Summer, at the latest. Hey thanks! The apple fiasco happened at the Giant in Tampines. It was my first grocery shopping experience ever in Singapore. We don't usually shop there now though. I usually hit up the same places you mentioned. I L.O.V.E Grandma Hoerners!! I go there whenever I pass that way. They have such good stuff! Your pie looks good enough to eat! LOL. I love your 4-year-old self with all the bling! CUTE. So, do you need another care package from Jenny and I?? If so, email me a list! Love ya!